This was a difficult novel for me to review: superb in some aspects, aptly first-novelish in others. In conclusion, I'll just have to rip off Pornokitsch's accolade for Brandon Sanderson's The Way of Kings, and turn it on its head. Nights of Villjamur is 'conceptually brilliant'. The ideas, for the most part, are fantastic: Villjamur is a Mieville-esque setting filled with plot opportunities in a crazy, New Weird-style mix. Banshees mourn the dead, cultists engineer relics of ancient civilisation to accomplish incredible feats (there's even a glimpse of a 'magic junkee' on one street, which I found a fun idea). The plot, likewise, could have been brilliant: there's something for everyone in the varied plotlines, with mystery in Jeryd's viewpoint chapters, a military endeavour with the guardsmen, and the occasional glimpse of the cultists' recovered magic. Furthermore, it's set in the preparations for an ice age, where food and fuel are scarce and the certainly isn't enough for anyone. If it had focused on this, it could have been an incredible transformative fantasy, with tough decisions being made constantly. Instead, Rika's attempts to help the doomed refugees are barely commented on or criticised as futile - the refugees are merely there in the background as vulnerable targets. The focus on the cult shifts everything away from the initial apparent target of the novel, which I found a slight decline in what could have been an even more original novel. Nevertheless, a lot of what Newton does is superbly crafted: Randur's viewpoint is initially mysterious enough to intrigue us with questions. What is he after? Why under an assumed name? What does he want with the cultists? Although the tension isn't quite held up, there is definitely a fun climax to his plotline. Unfortunately, some of the technical aspects weren't quite so well handled: the relationship between Randur and Eir didn't quite seem convincing to me, and I though Brynd's partner needed more development. The cult, as well, were a bit of a letdown for me, seeming fairly stereotypically evil without much apparent reason: although I can see them making harsh decisions for the greater good, their reasons aren't elaborated on at all. 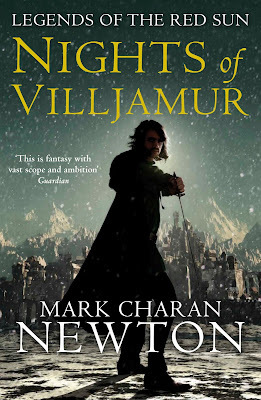 Despite these problems - which are very subjective - Nights of Villjamur is an intriguing fantasy with plenty of potential for future books in the series: I've heard that the sequel, City of Ruin is even better, so I'm looking forward to reading this. In conclusion, Nights is definitely a good book, but it could have been an incredible book: as its sequels may well prove to be. Have you read this book, or know any similar novels? Feel free to comment and tell me! Hey! Just stumbled upon this review as i have just purchased the book for 99p in The Works! Gotta love that shop. So yeah, your review has made the book go up the reading list! The insert on the inside cover didn't grab me, but for 99p i thought i'd give it a try, and your review certainly makes it seem more interesting. Lets hope i agree when i've read it! Hey Dreamer! Great - it's well worth reading just as the prelude to City of Ruin, which is a much, much better book. Looking forward to hearing what you think!